The story behind Animals is a brutally honest and intimate look at two young lovers who suffer from drug addiction. Based on true life experiences of David Dastmalchian, who not only co-stars in the film alongside Kim Shaw, but also wrote the script which went on to receive a Special Jury Recognition for Courage in Storytelling award at SXSW. I sat down to speak with these two leads as well as the director Collin Schiffli. 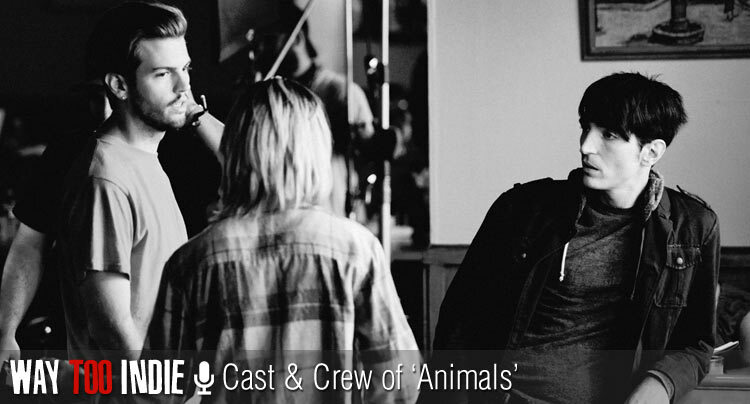 Also joining us was Passion Pit member Ian Hultquist, who wrote the original score for Animals. Our conversation on this indie film touched on a variety of topics including, how Christopher Nolan indirectly created the connection between the writer and the director, if it’s really easy to act in something you also wrote, how you should never give up on yourself, and much more. Were you more excited that your film was accepted into SXSW or are you more nervous for it’s world premiere tomorrow night? Collin Schiffli: I think they go hand-in-hand. It was obviously so surreal to be accepted, especially after just finishing the movie. But I’m sure the nerves will start to set in at the premiere tomorrow night. Collin, you have a production assistant credit on The Dark Knight Rises and David Dastmalchian had a role in The Dark Knight, is the common link between you two Christopher Nolan’s Batman franchise? Collin: Yeah, it was a coincidental connection on the production of The Dark Knight. I found out that Dave lived in Chicago and I thought he was awesome in the movie. And I said that I need to put him in my student film and he said yeah. It kind of spiraled from there. So it’s an indirect connection by Christopher Nolan. So David, you wrote the screenplay based off your own experiences right? David Dastmalchian: Yeah. The screenplay was inspired by my own personal journey for sure. It is a narrative piece of fiction with fictional characters, but I personally spent a number of years battling drug addiction that led to being homeless. It evolved from my own experiences into more universe themes. What was the most exaggerated part from your real life experiences? David: I can say every experience when you’re watching these characters is something I either witnessed first hand or was privy to. I wanted to show the potential of Bobbie and Jude, like how animals in a zoo have so much potential living in these little boxes. So I was looking for ways to demonstrate their intellect. One of them is a pivotal scene at the mid point where they pull off a pretty elaborate scam in a train station. That was a complete invention of my own doing. The one with the laptop! David: Yeah! It’s a grift that has been around for a long time called “the ring drop scam”. I was trying to show how smart these [characters] are and right around that happening [in the film] they have a conversation about what it would have been like to be on normal tracks. I think Animals really shows how creative people can get when they are desperate. David: I was in college at one point and went to work in Alaska on a fishing boat and I ended up living in a homeless shelter when I was trying to get on this boat. I remember this guy who had inventions that he would draw on pieces of found paper. They weren’t like madman inventions. They were actually really great ideas. I remember thinking this is so sad. It’s not a waste, I don’t like that word. People aren’t a waste ever, no matter where they are. But oh god, the potential [they have]! I’m guessing you [Kim Shaw] didn’t have that level of personal experience that David did. So how did you prepare for a role like this? Kim Shaw: I have definitely dealt with addiction, but not substance abuse by means. But people deal with things in their own way. I really wanted to make sure that Bobbie was kind of this beacon of hope, like David was saying with potential. They are both beautiful people who just got lost somewhere. I did a lot of research that one could without actually bringing a needle to one’s vein. David was so helpful and very open about a time in his life that is extremely painful and dark. I was an incredible thing to go to a place like that as an actor. The score really supplemented the film with a sulky and grim tone. How did you go about approaching the original score, Ian? Ian Hultquist: It was definitely a long process. I was lucky enough to get involved almost two years ago. I had the script and started talking to Collin and getting the idea of what they wanted to do in my head. And I just started writing right away. I went through a lot of different tones and textures. It was mentioned that you actually flew out to visit the set during some of the filming. Ian: Yeah. It was important for me to see what was going on. It also helped that I am from Chicago, which is one of the things that drew me to the film in the first place. Collin, my wife, and I went on a very preliminary location scout back in January. Then I went back in the summer when they were about to start shooting. So I got to see some of the places the character were going to be living in. Other than being a beautiful city, was there a reason why you wanted to shoot it in Chicago specifically? Collin: [David] and I both know Chicago so well. But in order for the film to work it had to be as real as could be. Since that was the place where this actually happened [to David]. We decided not to use any shortcuts and shoot the film in L.A. or anywhere else. Collin: The energy of the people there was incredible. Even the most neglected neighborhoods in Chicago welcomed us with open arms. Sounds like it might have actually been easier then to shoot there than somewhere like L.A. or New York. David: Yeah. The genesis of the script was written when I lived in Chicago. And I experienced most of the motifs that you see in the film in Chicago. Plus, we were able to pull a lot of great talent from the area. Kim and I were the only ones that came from out of town. John Heard actually lives in L.A. now, but he was a Chicago guy. Is there a particular shot that you are the most pleased with? Collin: There’s a couple that I go back and forth on. In the beginning of the film, there is a shot where Bobbie and Jude are starting their daily routine and they are walking underneath a bridge through the city. As cars are going by the two are flirting with each other. I think that encompasses 100% of how I wanted the film to look, observing these two characters in their environment. Kim: Some of my favorite scenes were things that we caught on the cuff. There was one day when we were on the beach and there were all these dogs running around. David just went out and started to play with the dogs and the sun was setting. It was magical. Religion is a theme that is subtly brought up a couple times throughout the film. For example, there is a marquee that reads “Christ Died For Our Sins” on top of a building in the background of a shot. What was the purpose of these slight religious undertones? Collin: A lot of that stuff was kind of a happy accident. It wasn’t a theme that I feel like wasn’t fully present in the script, but there were little elements in it though. David: [It’s about] the idea of finding redemption through religion and spirituality. For my character, there is a history that is not on the page, but something I would play with as an actor when I would be confronted with an image the virgin of Guadalupe. Hopefully the audience will understand that there is some history these people have. Personally, I believe that there is beauty in that. There is a beautiful idea that there is some benevolence in the universe and that spirituality has a redemptive quality to it. These characters are so in need of that. Even when they don’t notice, there are messages of hope literally in their line of vision, but they are not able to pay attention to that. Did it make it a lot easier to act in something that you wrote? David: [pauses for a moment] It’s different. There are so many other elements than just saying I wrote it. Kim: You want to fight more for your choices [to be included in the film]. David: Yeah. I definitely felt like I could be a good resource. It had its challenges in that I did know the script so well that when you go to execute a script into a film, it becomes it’s own animal. You have to let go of everything. Memorization was great though [laughs]. Considering the subject matter of the film, there are probably a lot of difficult scenes in the film, but was there one in particular that was the most difficult to act in? Kim: I really wanted to make sure that the drug [scenes] were done correctly. I wanted to sort of honor people who are struggling. I never wanted it to seem like we were playing with it. So that was difficult for me. What do you hope the audience gets out of Animals? Collin: I really hope that they see that there ways out there to help people. These aren’t villains. This isn’t a world that you see so often in drug [addiction] movies where it’s being glorified. We wanted to go way beyond just a “drug film”. These are real people. Kim: I love how there are all moments of people who are willing to help, [in this film] we have the nurse and Bobbie. David told me this beautiful story about these people who [because] just saying one thing changed his perspective on his journey to get out. There are people who want to help, if you want to be helped. David: Yeah. I hope people watch the film and are reminded to not give up on anyone. And never give up on yourself.